Environmental products for addressing spills including jet fuel, oil, gasoline, plus 1,000s of others. Containment and filtration systems preventing contamination of precious land and water resources. Purify and recycle water contaminated by organic chemicals in a wide range of environments. Unique applications of IMBIBER BEADS® for the military, law enforcement and consumer goods. Learn more about how Imbiber Beads can work for you. IMBIBER BEADS® are a single sourced, super aBsorbent polymer (SAP) used to imbibe organic compounds (hydrocarbons), completely containing pollutants. 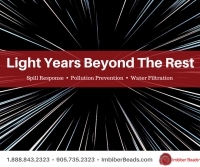 IMBIBER BEADS® also serve as a tool for storm water filtration, containment shut-off drains and a unique option for filtering/recycling water used during fracking, oil refining, oil drilling and more. Increased/stricter government environmental regulations, a paradigm shift in corporate responsibility (ie. strong focus on occupational health and safety), and the environmental awareness/expectations of the general public have made environmental (land & water) care a top priority. Our goal at Imbibitive Technologies is to advance environmental protection, recovery and sustainability through the development of innovative products and technologies addressing the needs of our clients around the world. Contact an aBsorption expert to learn more.